Lift your voice in praise with these latest releases from the best selling INTERNATIONAL 25 series. Each of these bargain-priced CDs includes 25 of your favourite old-time gospel songs, including What a Friend, Blessed be the Name and Sweet Hour of Prayer. From Brentwood. 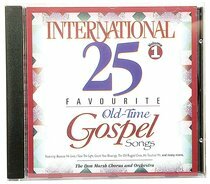 About "International 25 Old-Time Gospel Songs Volume 1"